Welcome to Saara Blog theme from Designthemes. 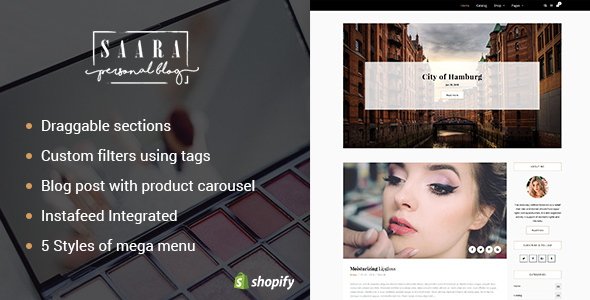 Saara theme is a beautiful Blog theme designed in Shopify for managing your Blogs and personal websites. When you take the first look at Saara theme, you will be impressed by it’s simplicity. Yet in the same breath, you will be astounded by its beautiful design. Sell anything you want from your site, as Saara comes as a Shopify theme that specializes in e-commerce. Saara theme could be easily configured to suit your business or service requirements. Saara theme is built with Shopify, which is arguably the finest e-commerce platform for launching your products online. If you are in Blogging space, you can’t afford to miss Saara theme. Not only that, Saara is a perfect fit for writers, artists, feminists and other art professionals who would be setting up their blogs with the services they offer. Saara is a perfect theme of choice offering an awesome fit for any e-commerce store with amazing user-friendliness. Saara Blog Theme offers a Homepage, and a page on About us, a beautiful Blog section and a Contact Us page. Create engrossing content on your site using the Owl slider. Saara Blog theme is a perfect fit for bloggers, writers, artists, and individuals wanting to create a personal website. Having developed more than 50+ themes in Shopify platform, we offer our latest Saara e-commerce theme with intuitive features needed for successfully running your online store. Saara Blog theme comes with wonderful technologies such as Sass CSS, Owl Carousel, Font Awesome and Animation. Besides, we have included Owl Slider, Product featured slider, and Product Carousel. Saara theme comes with detailed documentation on everything a user would need in terms of installation and configuring the theme. Designthemes provides the finest support for themes through emails, phone, video tutorials and dedicated 24/7 Knowledgebase from Designthemes Helpdesk. You could get your queries resolved quickly anytime. Therefore go for Saara theme ably supported by the legendary support team of Designthemes.